As educators, we are in the people business. Yes, we deal with curriculum and instruction daily but the currency of our profession is founded in relationships. We are also in the continuous improvement process daily and that include coaching others and having those conversations that many may feel inclined to shy away from. We can all remember that first difficult phone call or conversation with a parent. It wasn’t easy, but we survived. But, what happens when the “issue” is with a colleague? By and large, educators are pleasers, and we don’t seek out confrontations. College may have prepared us with the theoretical constructs on many educational issues, but somewhere along the way we all missed the class on giving and receiving constructive feedback. 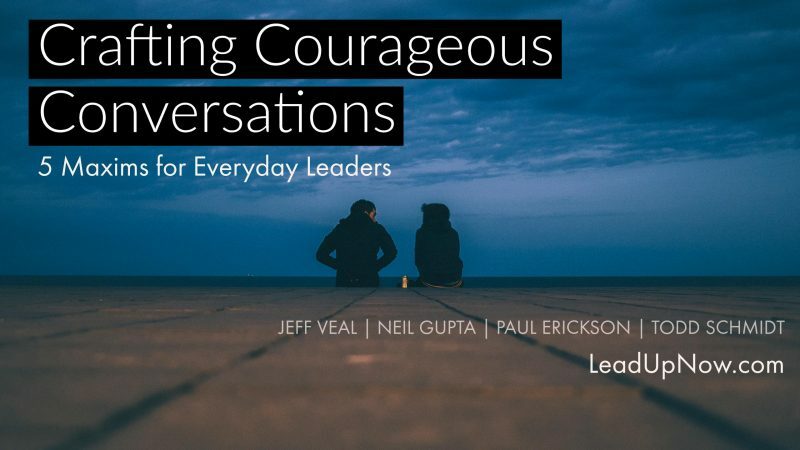 Yet, real understanding in how to approach, prepare for, and execute courageous conversations with others is crucial for the success of any leader. In educational leadership roles with several decades of experience we have found “5 Maxims for Courageous Conversations”. If you are a leader you can’t avoid them. Maxim #1: A Courageous Conversation is about crafting constructive communication, not collisions. Bottom Line: Courageous conversations avoid creating winners or losers. You will both gain relational credibility with one another. Maxim #2: A Courageous Conversation is one in which leader takes his/her work personally and leads with heart. Advice to leaders entering difficult conversations is typically filled with maxims like “don’t take this personally” or to relax and “not take yourself so seriously.” In the book Fierce Conversations, Scott asserts that these suggestions are misguided. She, instead, urges leaders to take themselves and their work personally and seriously. Leading courageously is “seriously personal” business. When leaders take their work seriously personal, they come out from the behind the conversation, that is the safety of pleasantries and the futile efforts to placate others, and make it real. Bottom Line: Courageous conversations are ones in which the leader takes the work seriously personal, showing his/her true self and influencing others to take action. Maxim #3: A Courageous Conversation is grounded in clearly defined and communicated core beliefs. Bottom Line: Courageous conversations about beliefs up front avoid uncertainty or misconceptions among the team. Maxim #4: A Courageous conversation is listening for understanding, not listening to reply. Bottom Line: A courageous conversation is about active listening. Maxim #5 – A crucial conversation is essential if we want to bring about lasting change to our school culture and school community. In School Leadership That Works, Robert Marzano describes the difference between first and second-order change: first order is incremental, and in many cases, it can be easy and manageable. It’s something like changes to playground supervision schedules or school dress code policies. Bottom line: A Courageous Conversation is one that brings about second-order change. This piece was a collaborative effort on the part of the co-leaders within LeadUpNow & #LeadUpChat – Jeff Veal, Dr. Neil Gupta, Paul Erickson, and Dr. Todd Schmidt. Though we serve as administrators in four different states our commitment is the same. Together, we are committed to changing the tone of education and building capacity in the everyday leader whether in the classroom or conference room.